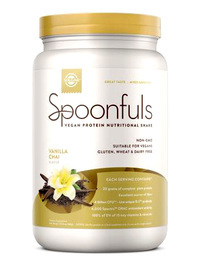 Spoonfuls Vegan Protein Powder - Vanilla Chai, 20.74 oz (Solgar - Penn Herb Co. Ltd.
Solgar® Spoonfuls makes it easy to add a plant-based source of protein to your diet every day. 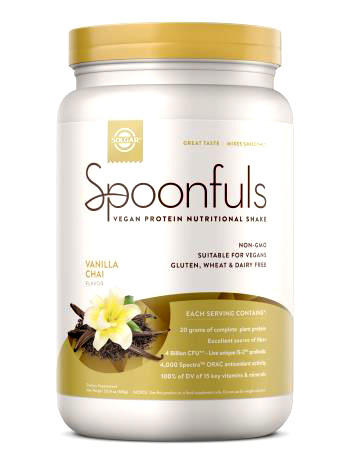 Three small scoops throughout your day give you 20 grams of protein plus whole food and plant-based concentrates, probiotics, digestive enzymes, nutrients and a rich complement of essential vitamins. OTHER INGREDIENTS: Soluble Corn Fiber, Natural Flavors, Inulin, Gum Blend (Organic Gum Acacia, Organic Guar Gum, Xanthan Gum), Maltodextrin, Stevia. CLICK PRODUCT LABEL TO SEE FULL LIST OF INGREDIENTS. Easy-mixing, vegan, dairy-free protein nutritional shake. For adults, mix three (3) scoops (41 g) in 12 ounces of your favorite non-dairy beverage of choice and blend or shake vigorously once daily. May also be blended with fresh fruit. Not in the mood for a morning shake?...add one small scoop to your favorite yogurt. 50 calories per small scoop.